Joe Cooper Ford of Tulsa is excited to offer this stunning 2010 Ford Flex SEL in Ingot Silver Metallic, BLUE TOOTH HANDS FREE, MP3 PLAYER, NO ACCIDENT HISTORY ON AUTOCHECK, **HEATED SEATS**, **3RD ROW SEATING**, **SATELLITE RADIO**, **FORD SYNC**, and **REVERSE SENSING SYSTEM**. Rapid Spec 205A. Here is another GREAT VALUE brought to you by OKLAHOMA's BIGGEST FAMILY OWNED DEALER. 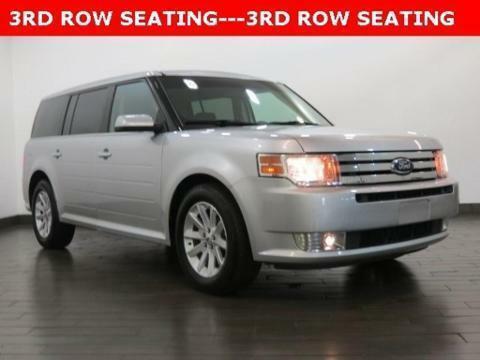 *** Imagine yourself behind the wheel of this charming-looking 2010 Ford Flex. New Car Test Drive said, ...The exterior design is distinctive and memorable. The interior is filled with clever details and surprise-and-delight features. High-tech touches abound... Consumer Guide Recommended Midsize SUV. This terrific Ford is one of the most sought after used vehicles on the market because it NEVER lets owners down. ***CALL 888-680-0566; email us or stop by our location just off the BA Expressway @ Sheridan. One of our dedicated Internet Sales experts will show you an AMAZING buying experience!